Editor's note: Memorial Day is set aside to honor men and women in uniform who died fighting for American freedoms. Today, the start of Memorial Day Weekend, we also want to remember the struggles of veterans who live on the streets or in tent camps and how Florida Methodists are trying to help. For a related story, click here. One by one, United Methodist churches across Florida have discovered the secret of high numbers of veterans living among the homeless. Here are the stories of how some are answering the call to help. 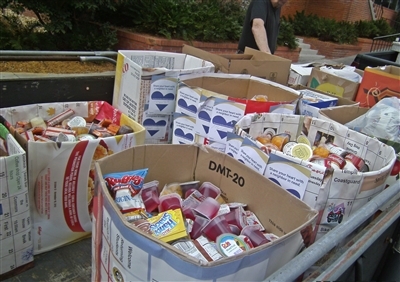 Food collected at Stetson University, above, led to the discovery of homeless veterans living in the woods, and Deleon Springs UMC's yoU Turn ministry was born. Photos from Marcia Davenport. 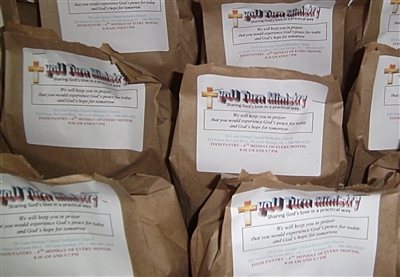 Driving with lunch bags from a food drive for DeLeon Springs UMC in January, Marcia Davenport saw someone standing on the roadside with a sign. "I passed the person, and as I got to the first turn in the road, a voice said, ‘Turn around.' Three times I heard the voice. So I went back and handed him the food and he was so appreciative." She asked if he had friends who also needed food, and he motioned toward a wooded area. "He led me into the woods and, believe me, I was terrified," Davenport said. "I told him, 'This is all God's moment.'" She met three homeless veterans, and the yoU Turn Ministry was born. She started taking toiletries and clothing to the men, as well as food. Church members have supported the ministry with donations of clothes, blankets, tents and other staples. Eventually, the men began coming to church and volunteering. "They're such great people," Davenport said. "They're a family. They take care of each other. … Even though they don't have a house, they have a home." Walking into a homeless camp alone just over three years ago, Eric Mercado knew he was in the right place. “I feel drawn to help those who are most needy in my community,” said Mercado, outreach coordinator at First UMC, New Smyrna Beach. 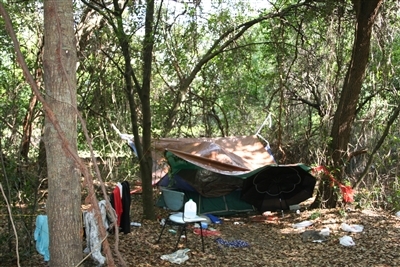 Thousands of U.S. military veterans live in tents in homeless camps like this one in Seffner. Photo by Susan Green. Mercado and his friend, veteran Don Kurtz, regularly meet with homeless vets, trying to help them out of that hole with simple things like an ID card. Mercado, a former Peace Corps volunteer who worked with farmers in Tanzania, now helps run a hot meal program at First UMC. Sixteen local churches pitch in to cook dinner for anyone who needs it every Monday, Wednesday and Friday. The program, which fed more than 21,000 last year, is now a mecca for the homeless and those who want to help. Between the hot pots and soft drinks, there are tables of clothes, supplies and small groups who talk to the homeless, offering to help break the cycle of despair. “Sometimes people just need a little direction,” Mercado said. Covenant UMC, Port Orange, filled more than 400 bags with staples for veterans as part of its Sunday Serve program last year. The bags, filled with food, cleaning supplies and small Bibles, were handed out to veterans at a Stand Down for Homeless Vets event in Daytona Beach recently. Stand Down is an advocacy group for homeless vets. “We even had our Sunday school children draw cards for the veterans and include those,” said Molly Mockley, Covenant’s volunteer coordinator. The Stand Down event included free medical checkups and haircuts, a legal adviser and advice on benefits, housing and jobs. Covenant is actively involved in ministering to the homeless, but helping vets opened some eyes, Mockley said. “We owe our veterans a great deal because they were willing to put their lives on the line for us and our country,” she said. Up to 40 percent of the more than 1,000 homeless in Charlotte County are veterans, according to homeless advocates, and helping is part of the mission at First UMC, Punta Gorda. The church is heavily involved in food and clothing drives and works closely with the Jesus Loves You Ministry delivering aid to the homeless every week. A reception in the church’s Life Center that began earlier this year is also taking off. Showers, haircuts, lunch and clean clothes are provided at the event, which drew almost 30 homeless men and women last month. There are a myriad issues driving people to live in plastic canopies in the woods, said Peter Gillen, who chairs the church’s Send Team. “Some of the people may have drug or alcohol addictions as well as medical and psychological problems but there are also people that are homeless just because they lost jobs,” Gillen said. The Punta Gorda church now wants to expand the mission to the homeless, including vets. “We are talking to other local churches to partner and see if we can tackle this problem,” Gillen said. The U.S. Department of Veterans Affairs (VA) estimates that 131,000 veterans are homeless on any given night; the National Coalition for Homeless Veterans puts the number at 200,000. Most are single males from poor, disadvantaged communities. The VA says 45 percent suffer from mental illness and half have substance abuse problems. 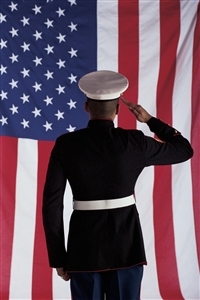 • 23 percent of the homeless population are veterans. • 33 percent of the male homeless population are veterans. • 67 percent of homeless vets served three or more years. • 25 percent have used VA Homeless Services. • 85 percent completed high school/GED, compared to 56 percent of non-veterans. • 89 percent received an honorable discharge. -- Kevin Brady is a freelance writer based in the Tampa area. Florida Conference Connection editor Susan Green contributed to this story.